I guess you can already see some similarities between us. I like to write, as does Jughead. He is interested in local news as pertaining to the murder mystery of who killed Jason Blosom. I love murder mysteries. Otherwise similarities are not so easy to spot, unless you know me and my back story. Episode S1E7 made me cry. I don’t cry easy, but just let me say this episode in particular touched me. 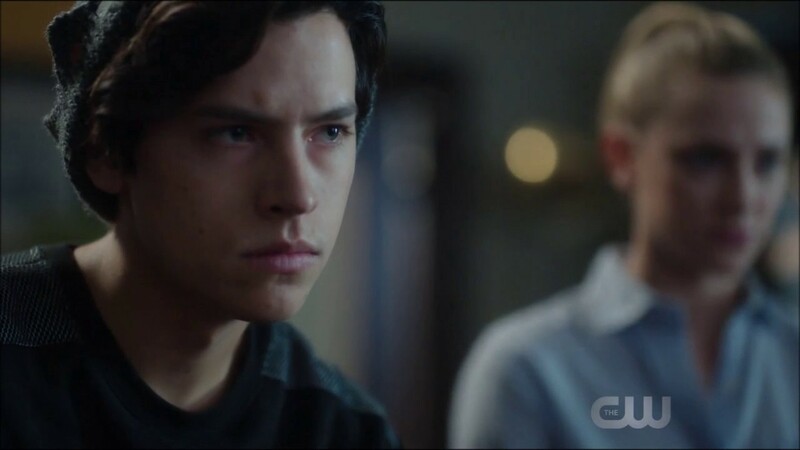 It was because I felt what Jughead was going through with his dad. Having a parent who is “drowning,” to use the words of Fred Andrews, Archie’s dad, you can try to help them all you want but in the end they just pull you down with them. If they don’t want to help themselves there is NOTHING you can do to help them. I know that Jughead still has hope. I don’t blame him for that, but I’ve been there for such a long time I have given up hope. I do hope for him in this series that he doesn’t have to wait long and his dad will change… but that remains to be seen. You see when you are a child you don’t really understand everything about your parents. When you reach high school you think you know everything, and you don’t always see both sides to each story or know your own parent’s back story. I have found out lots of things and a lot of them I won’t bore you with. I was always made to believe I was such a bad kid. Truth be told, I wasn’t nearly as wild or such a bad seed! I have only begun to find out in the past 10 years more about both of my parents. My dad is the one who has been the one I could rely on. My mother, on the other hand not so much. I have been out on my own since I was about 17. That was when my parents split up and I tried living at home with just my mom. That just didn’t work out for me. My mother is very controlling individual. Lots of guilt trips were put on me if I didn’t stop what I was doing straight away and bring her whatever she wanted. No matter what I was doing. She went to a party with me after seeing a friend’s band play and I was informed that she was upstairs smoking pot. You might see my complaints as well she didn’t have it that bad. I’m not saying my life is the worst story you have ever heard…let me just state that right now. Once I was out on my own, couch surfing and living somewhat out of my own car… she would still ask me for favors. My mother has had a few boyfriends. All of them being losers, and each one being a bigger one than the last. The first one she would call me up and have me go spy on him by driving by his house after I left work. JOY. I remember taking her over to his house to get some of her stuff back when the cops were called out to the location because they had an altercation. I remember he was with some other lady at the time who was trying to pit us against one another. I called her out on this and refused to play into her mind game. First time I cussed in front of an officer. Good times. Then there was the second loser of a boyfriend. He had bipolar disorder and would routinely not have enough funds for his medicines so he would go without. I would on the random occasion be contacted because he was being mean to her and I was supposed to do something about it. One occasion, I was out at dinner celebrating a friend’s birthday and was called to come fix her food because he would not do so. I also got called once because he was throwing stuff at her and I was to make sure he left the house. After she kept letting him come back I put a stop to her calling me to help her break up with him. Now my mom is with her third boyfriend…second of which she has been living off of his disability with him. A tree came down and basically ruined her house and she for some reason thought she would try to see if they could stay with me. I knew that if I did that I would never be able to get her out of my small one bedroom apartment. So I told her no. Then I got a guilt trip on which I hung up on her. I stopped talking with my mom for about two years until her mom, my grandmother, was about to pass. We don’t talk much now and I actually like it better. I have actually learned to let go do what is best for me… which normally means I don’t speak to my own mother. I learned what it means to love yourself first. [Thanks Jared Padalecki] To me it means to remember your feelings and what you can handle and what you can’t…and its okay to just walk away of you can’t deal. Further on in the season, Jughead has even more emotional moments with his Dad who just isn’t there for him. I see the parallels when JP talks about how his firing is Mr. Andrew’s fault and takes none of the blame. A sentiment I know all too well. My mom is the same way that it is everyone else’s fault how her life has turned out. Somehow even partly my fault for not doing more to help her… but I refuse to believe that or feel like it is my fault. I am not responsible for supporting not only myself but my mom. I was raised to be independent and to be able to fend for myself. I don’t expect anyone else to support or help me. I’m an adult and that is my job to support myself. Maybe one day my mom can see that fact as well, but I’m not holding my breath.